In my opinion August and September are the best time of year where I live. Every one's fruit trees seem to be busting at the seams and there are peaches everywhere. So many in fact that we have a event coming up to celebrate just that. Peach Days. Now who doesn't love peaches? And who doesn't love Cheesecake? I had some peaches getting extra ripe in my fridge and I was trying to decide what to do with them. My sister has the most amazing fresh peach pie recipe (I'm hoping to post that soon). But I hadn't written it down when she gave me the recipe and I couldn't get a hold of her. So, what to do, what to do? 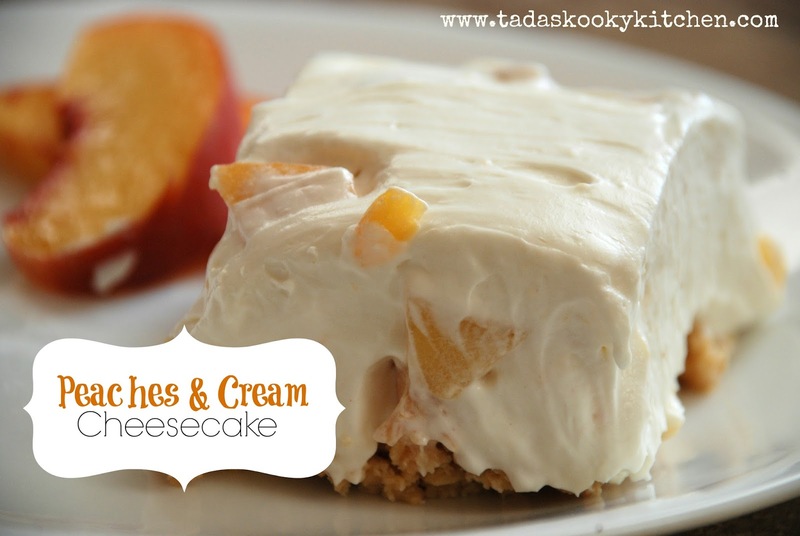 I adore cheesecake, all different kinds and I thought of the peaches sitting in the fridge and decided I could throw together a cheesecake with the ingredients I had on hand. It turned out so amazing, that even now, just a few days later, my kids are already asking me to make it again. The great thing about this cheesecake is that it's no bake. Woohoo!!!! Right?!! Bonus! Hope you all enjoy it as much as we do. In food processor, blend cookies till they are crumbs (or you could put them in a gallon size zip lock bag and crush them with a rolling pin). Once the cookies are crumbs, stir in melted butter. Press cookie mixture into the bottom of a 8x11 glass pan. Place crust in fridge, while you prepare the filling. For filling, mix cream cheese and powdered sugar with an electric hand mixer. Once that is mixed well add vanilla and whipping cream. Mix on high speed for 3-4 minutes or until your mixture starts to thicken. Add peaches and stir gently. Then pour the filling over the crust and refrigerate at least 2 hours. As a side note, you could do a lot of variations on this recipe. You could add different fruits, strawberries or blueberries. You could even add crushed regular Oreos, or candy bar pieces. This would even be good plain. The possibilities are endless.